You'll be £12.99 closer to your next £10.00 credit when you purchase Life on the Victorian Stage. What's this? The expansion of the press in Victorian Britain meant more pages to be filled, and more stories to be found. Life on the Victorian Stage: Theatrical Gossip looks at how the everyday lives of Victorian performers and managers were used for such a purpose, with the British newspapers covering the good, the bad and the ugly side of life on the stage during the nineteenth century. Viewed through the prism of Victorian newspapers, and in particular through their gossip columns, this book looks at the perils facing actors from financial disasters or insecurity to stalking, from libel cases to criminal trials and offers an alternative view of the Victorian theatrical profession. This thoroughly researched and entertaining study looks at how the Victorian press covered the theatrical profession and, in particular, how it covered the misfortunes actors faced. It shows how the development of gossip columns and papers specialising in theatre coverage enabled fans to gain an insight into their favourite performers lives that broke down the public-private divide of the stage and helped to create a very modern celebrity culture. The book looks at how technological developments enabled the press to expose the behaviour of actors overseas, such as when actor Fred Solomon's' bigamy in America was revealed. It looks at the pressures facing actors, which could lead to suicide, and the impact of the 1857 Matrimonial Causes Act on what the newspapers covered, with theatrical divorce cases coming to form a significant part of their coverage in the latter half of the nineteenth century. Other major events, from theatre disasters to the murder of actor William Terriss, are explored within the context of press reportage and its impact. The lives of those in the theatrical profession are put into their wider social context to explore how they lived, and how they were perceived by press and public in Victorian Britain. Vlog review as featured online here. This is a fascinating insight into the gossip of columnists of the time. In sum, this is a book that will greatly assist writers, historians, and people passionate about the Victorian era and the history of the stage in the UK. It is a good starting point for those who want a general view of the topic and/or are looking for inspiration for their next story or research project. And if you just want to confirm that people’s love for gossip about the stars has not changed over the years, this is your book. (Oh, and I’m pretty intrigued about the writer too. I think she is somebody writers of historical crime novels might want to follow closely). Nell Darby draws on newspaper accounts from the time to uncover exciting stories of the Victorian theatre. 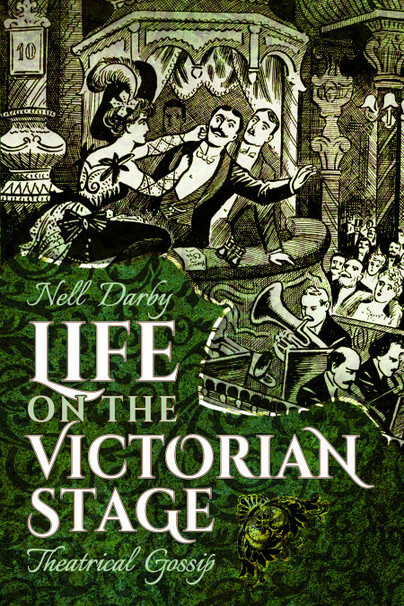 In this excellent book, Nell Darby takes a close look at the lives of the people who performed on the stage in Victorian England's theatres. Essential reading for hisrotians and students of theatre history, of course, but written in such an engaging style it will appeal to just about anyone. An informative and interesting read. Would recommend. Four Stars. Life on the Victorian Stage (and, really, it’s as much about life off it) is an entertaining book, mostly based on court cases that, in one way or another, involved actors and actresses, theatre managers, and the general world they inhabited. As referenced in the 'further reading' section of author article on tracing your theatrical ancestors. This is a useful reference book for those studying the Victorian stage. Dr Nell Darby is a historian and writer whose PhD is in the history of crime, but who originally trained as a newspaper journalist. As the descendant of Victorian performers and journalists, she has long been interested in the lives of nineteenth-century actors, and how these lives were reported in the newspapers. Nell writes the popular Criminal Historian blog; this is her third book.